Grace trying on her favorite mask from Masquerade. 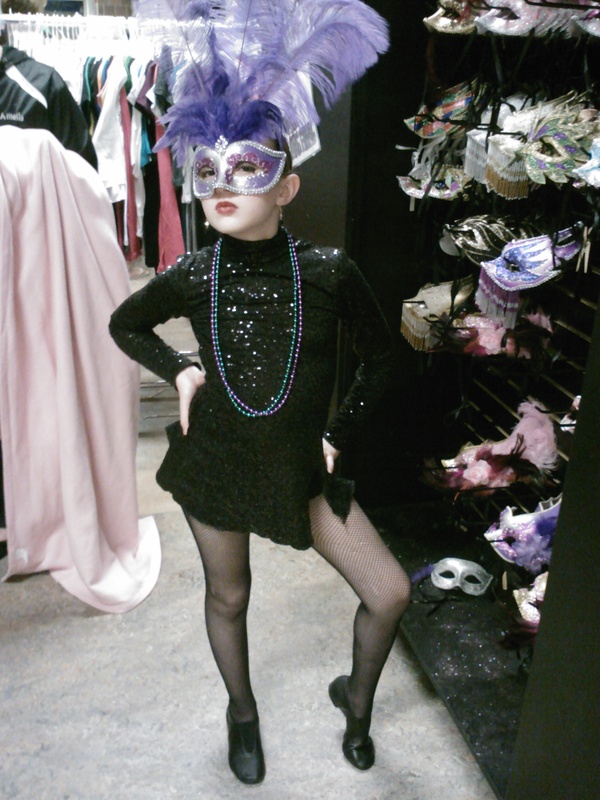 Last year, Grace danced at the Masquerade Dance competition. I loved it then, and I loved it again this year! In the past, the competition was held at the Burnsville Center for Performing Arts. I’ve blogged several times on how much I love that place. A few weeks before this year’s competition, we found out that it had gotten so large, they had to split it, and move half to another venue. I was so disappointed to find out we’d be at Hopkins Auditorium. I was even more disappointed when I found out that Grace’s 2nd cousin was dancing at the Burnsville venue. When we got to the high school, we found our dressing area with the help of one of the dads. It’s always a bit overwhelming when you first walk in, and you don’t know where to go. Once Grace had her costume on, I went to check out the auditorium where they’d be dancing. It was very nice! It was also huge! No complaints here! It was nice that even from up in the balcony, we could really hear the taps. I didn’t see any microphones (like we did at other competitions). I’m not sure what they did, but I appreciated that we were able to hear them without it being louder than the music they were dancing to. Things were spaced just right between the dressing areas and the auditorium. The Masquerade “store” was in between. Grace loves the masks they have. I don’t know where it would go in her room, and I’m afraid it would get broken, so I have been hesitant on buying one. Program prices were very reasonable. I want to say they were $6, but I don’t remember for sure. 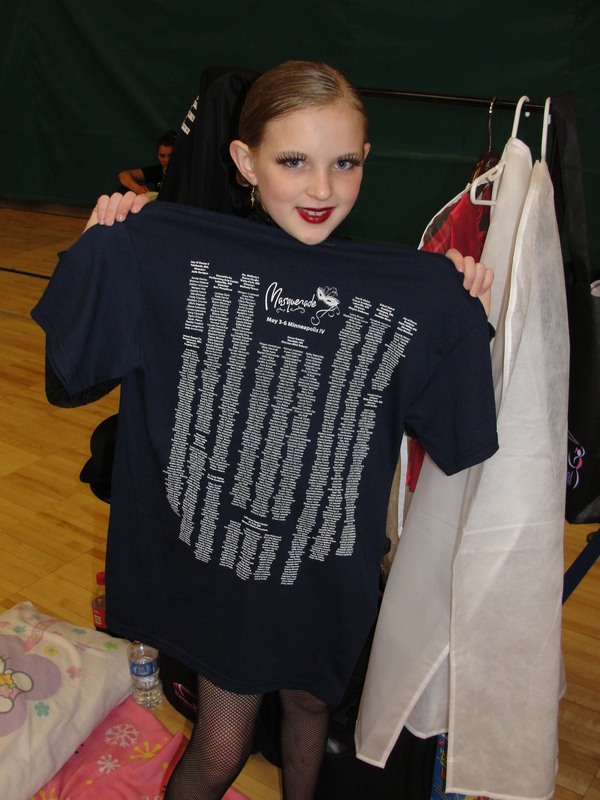 They also had t-shirts with everyone’s name on them, listed by studio. Last year Grace didn’t want one (and regretted it later). This year, I just bought her one. She was very excited about it! Food was at the end, near the entrance. Since it was at a high school, food prices were VERY reasonable. I had brought some sandwiches, but the pizza and hot dogs sounded better. I got those two items, a fruit bowl, and a bottle of Coke for $8!! I don’t know that it would be that cheap at a store. Needless to say, I was very happy (and loved that there was fruit offered). They also had pictures and videos for sale. At other competitions, I have seen pictures for $5 or more per photo. This one had them for $15 for all the pictures of an entire dance. I ordered 2, since we can’t take any photos of our own (and I am terrible at action shots even if I could). Unfortunately, my disc was blank when I got home. I emailed Dance Star Media, the company that was selling them, and they assured me they would send me another one. I am impatiently waiting! Overall, I was pleasantly surprised by this venue. I liked it. One thing I have to say about Masquerade, is that it is a high energy event. Besides the Spirit Award that goes to one studio (and makes everyone scream like crazy), there are fun breaks in the day. During some of the breaks in the dancing, people come out and throw out beads out at the audience. It’s worse than caffeine when it comes to energizing the crowd! It does make for a lot of fun though. I love, love, love that this competition keeps the dances in order. If there is a costume change needed, they just wait the extra couple minutes in between. They not only go in the order the dances are printed, but they kept pretty much on schedule too. This was MUCH appreciated, especially since awards were at 10 p.m.
Because of the way this competition was split up, the intermediate and recreational level dancers were all at the same venue. Many of the studios there were ones I had never heard of, but there were some really good dances there! 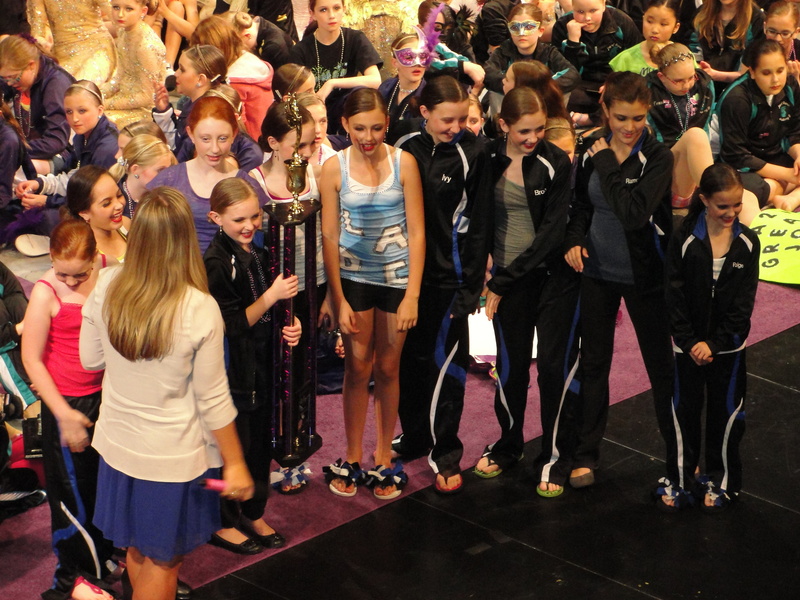 Dance Express and South Metro Dance Academy were two of the studios that had some of the higher scores. A friend of ours we haven’t seen in 7 years or so had a daughter who danced for South Metro. We didn’t get a chance for the girls to see each other, but we did get to see her mom. Most of the groups were at pretty comparable levels. Whew – the judging was tough at this competition! They were definitely stingy with their platinum awards. Platinum, High Gold, and Gold scores are based strictly on their points scored. The judges must have been really deducting for every little thing. Our girls scored high gold in all 3 dances. They did really well in all 3, but had some minor issues that cost them some points. Some of the things that happen on stage that cost points include dropping flowers, losing hats, etc. I have also seen hairpieces fly off in the middle of turns, falls on different “tricks”, etc. Regardless of the score, the other parents and I were happy with how they did. Here’s what Grace was hoping for – the Encore Award (aka “the big purple trophy”). All year, Grace and the rest of her class, was hoping they would win the big trophy. In order to do that, they would have to have one of their dances chosen to come back for an encore performance at the end of the night. This was going to be tough, considering the judges had 115 dances to chose 4-5 that they thought were the most entertaining. Out of the 4-5 dances asked to come back for an encore, one would be chosen to win the Encore Award. We had a feeling they might be asked to perform an encore for their Hungry Like a Wolf dance. The judges were laughing the entire dance… They WERE in fact, asked to come back for an encore!! During the rest of the awards, one of the other dances who did an encore, Speaking French from Dance Express, was raking in the hardware. 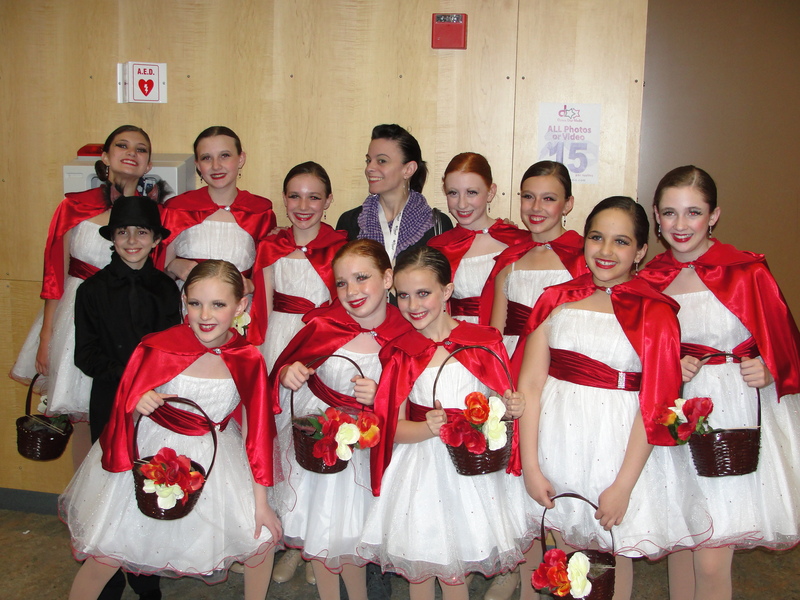 They scored platinum, first, judges awards… it was also a very fun dance. When they were on stage, I could really picture them on the streets of Paris for the first time. I thought for sure they were going to take home the Encore Award too. That’s why I was so surprised when they said, “and the winner is…” and started playing Hungry Like a Wolf!!! I think I screamed as loud as the girls did! It was a VERY exciting moment for everyone! They had accomplished their goal – and they deserved it! Loved reading this!I am competing there next weekend! 😀 What award do they give out to duet dancers, and do they give individual placement awards? Thank you! Everyone will be given either a Platinum, High Gold, Gold, or High Silver rating based on your score. They will have awards for the top duets/trios. How many places they recognize is dependent on how many entries there are.